Michael visits Sheila once a week. 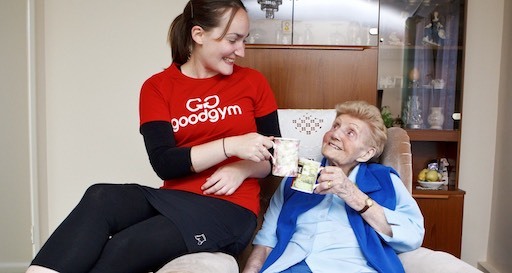 Sheila, 75, was referred to GoodGym by Tower Hamlets Friends and Neighbours and has been visited by four different GoodGym runners over the past few years. She’s now paired with Michael, who has been visiting her since October 2015. Originally from Birmingham, Sheila moved to Tower Hamlets twelve years ago to be closer to her son. She had lived on the same street in Sparkhill, Birmingham for 43 years and has recently traced her family back to the same area since the 1700s. Sheila’s brother ran a pub in Birmingham and she worked there for many years as a barmaid which she relished. Being the youngest and only girl out of the 5 siblings, her brothers always looked out for her along with all the people she met working in the pub. She said she felt safer there than anywhere in the world. Sheila’s husband, Michael, sadly passed away when she was just 25 years old. She brought up their two sons on her own. Although it was difficult to balance working and looking after her children, it didn’t stop Sheila becoming very involved in her local community which has always felt important to her. In Birmingham she stood for the City Council twice as an Independent candidate, started a Local Resident’s Association and later a Local Neighbourhood Forum. She also set up a Community Shop and became the Chair of the local Police Liaison Committee. In London she regularly visits her local library and church. She’s also a member of a book club and volunteers at the church foodbank. When Sheila was matched with her GoodGym runner, Michael, she knew they were going to get on because of his name. She’s always been surrounded by people called Michael: her cousin, her late husband, her son, her next door neighbour, her local vicar in Birmingham and her local vicar in Tower Hamlets. GoodGym opened up a whole new world to me; I’ve met people from all over the world and enjoyed some wonderful conversation. It’s amazing what you find out about people just from a weekly chat. I still keep in touch with some of the runners who have visited me in the past and I’m actually meeting up with one of them very soon. Now, of course, I’ve got my darling Michael who is absolutely fantastic. One of my favorite moments, although there are so many, was when Michael bought me a pack of cards which we play together each week. It shows what a kind fellow he is. I’m not too fussed about winning, I just enjoy playing. We’ve played a few different games but now the last hand is always winner takes all. The hour he’s here for always passes so quickly. I don’t know what I would have done without GoodGym and Tower Hamlets Friends and Neighbours. I feel i’m the most fortunate person in the world. I think it was my partner’s grandfather that flagged it up for me as he is often isolated and alone. I figured there must be hundreds if not thousands of lonely older people who could benefit from and contribute so much to a weekly visitor. I had a look online and GoodGym came up and thought it was a great idea which had built upon the traditional schemes. Regardless of how I feel on my way there (tired, unenthusiastic, stressed) my visits to Sheila are guaranteed to pick me up and leave me smiling. I don’t think Sheila even realises just how infectious her happy go lucky approach to life is! She’s a real inspiration for getting the most from life. Me and Sheila play cards each week and vary our games, recently we have started deciding the winner via a game called ‘War’ where ultimately each player picks a card and the highest card wins. One week I picked a King and Sheila looked quite sad. She then picked a card and it was an Ace – she squealed with delight, it was great to see. I’ve learnt many things from Sheila; the joys of bargain bins at Marks and Spencer for one thing! Sheila is and always has been active in her local community and takes real pleasure in meeting and talking to people. I think she is a great role model at remembering just how important it is to be physically engaged in your community and the people that live within it. I spend around 40 minutes a week with Sheila, with running time bringing to a maximum of an hour. The difference Sheila has made to my life and what she seems to get from it is definitely worth that amount of time. For anyone who isn't sure about becoming a coach runner I’d ask: can you really say you don’t have an hour to spare each week? There are lots of lonely older people waiting to be paired with a runner like you.